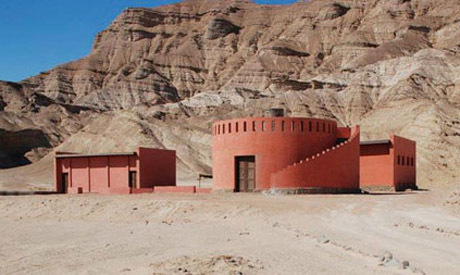 Overlooking the Red Sea coast where Serabit Al-Khadim area is located in South Sinai stands a rosy concrete cylindrical building displaying Sinai’s varied heritage. Named “Hathor House,” the Documentation Centre for Sinai Heritage (DCSH) has finally seen the light of day after four years of construction work carried out by the Centre for Documentation of Cultural and Natural Heritage (CULTNAT) under the supervision of the Regional Development Programme for South Sinai (RDPSS) and financed by the European Union (EU). CULTNAT aims at documenting the various aspects of Egypt's tangible and intangible cultural heritage as well as its natural heritage. This involves the implementation of the national plan of action, making use of the most up-to-date information technology in collaboration with national and international specialised organisations. The centre is affiliated with the Bibliotheca Alexandrina and supported by the Ministry of Communications and Information Technology. Yasser El-Shayeb, director of CULTNAT, said that the construction of Hathor House aims at maintaining and developing the local community through activities consistent with their needs; to protect and preserve the cultural and natural resources of South Sinai as well as promoting local participation in project activities and to support entrepreneurial initiatives in the community. The project, he went on, developed a model for cultural resource management (CRM) of the cultural heritage of South Sinai through the survey, documentation, preservation and management of archaeological sites, with and for the local community of Bedouins. “This has helped us create a sort of model for cultural resource management in this region and thus further apply it to more sites,” Yasser asserted. The outcome of these activities is to be a locally managed node serving as a small museum to house the artefacts found from nearby excavations and serve as a tourist information centre relating the history of South Sinai through documentaries, drawings, maps and photos. The centre also houses a small exhibition of South Sinai folkloric heritage. A 3D replica of Hathor Temple is also on display at the entrance of the DCSH in order to provide visitors with an glimpse of the most important archaeological sites in the area. Serabit El-Khadim was the mine of turquoise in antiquity and the house of the ancient Egyptian goddess of turquoise, Hathor, who was also the protector goddess in desert regions. In addition to turquoise mines, Serabti El-Khadim was home to a large temple dedicated to Hathor where almost 30 incidences of incised graffiti in proto-Sinaitic script were found. The script has graphic similarities to Egyptian hieratic script.